The former Chairman of the National Medical Association, a noted nephrologist with nearly 40 years of experience, managed a group of kidney dialysis treatment centers which was sold to DaVita, one of the two industry dominant public companies. After the sale to DaVita, the Chairman recognized an opportunity to create another dialysis business with a more patient centric approach including, among other things, increasing in-home treatment and improving cultural competency. The Chairman formed American Alliance Dialysis ("AAD") and attempted to acquire a dialysis business to establish a platform to pursue the opportunity. The Chairman's counsel made an introduction to M&A Capital to raise capital for AAD and assist in developing its operating strategy. During the initial months of M&A Capital's engagement, we assisted the Chairman in identifying the most suitable acquisition targets to establish a platform company. Ultimately, the CEO selected Atlantis Healthcare Group Puerto Rico, Inc. ("Atlantis") due to Atlantis' like-minded management team and its relationship with over 1,400 patients for which it cared through 13 strategically located centers in Puerto Rico. Simultaneously, M&A Capital assisted AAD in raising capital with investment firms with experience in health care. We made introductions to sources that recognized the Chairman's vision to provide better care for dialysis patients. 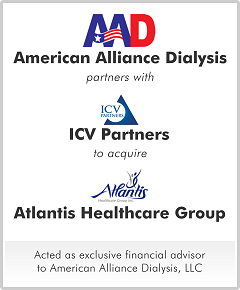 The Chairman selected ICV Partners,.a boutique investment firm, to partner with AAD. ICV performed a great deal of work to assist the Chairman in further refining the strategic plan, ultimately funding the acquisition of Atlantis for AAD.